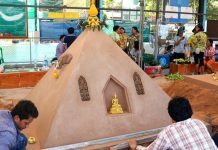 Pattaya’s Muslim community came together to raise funds to develop mosques and religious education in the city. 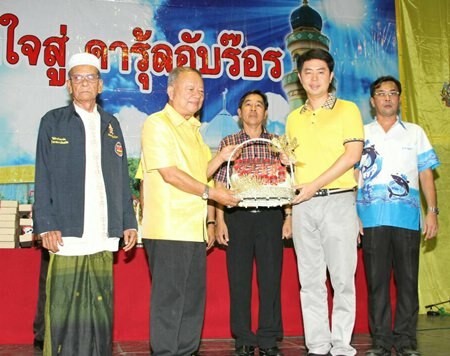 Former MP Poramet Ngampichet opened the Dec. 5 event at Darul Ibada Mosque in Soi Nernplabwan with Nongprue Mayor Mai Chaiyanit and Imam Kasem Jedaman, vice chairman of Chonburi Mosque. Jedaman said that the charity project is held annually and funds raised will support the construction of facilities unfinished since 2010 and 2012. Nongprue Mayor Mai Chaiyanit (center left) and former MP Poramet Ngampichet (center right) were guests of honor at a charity event to raise funds to develop mosques and religious education in the city. One project is a three-story building with six classrooms that has a 10-million-baht budget. Chonburi Province has contributed 500,000 baht while Pattaya and Nongprue have arranged funds for furniture and educational equipment. The Muslim community has not been very active in recent years so that is why these activities are hosted, he said.